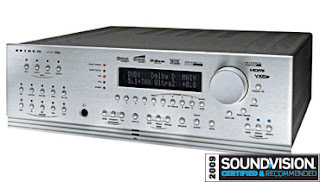 Al Griffin raved about the AVM 50v in his review saying that it "is a worthy successor to the company's AVM 50 preamp / processor, bringing a number of welcome audio features like the company's impressive ARC room-correction and built-in Dolby TrueHD and DTS-HD Master Audio soundtrack decoding. Video, too, gets a bump up with Anthem's addition of block and mosquito noise reduction." At the end of his methodical review, Griffin concluded by saying "I've often told friends and colleagues that if you're going to buy an A/V preamp/processor, Anthem is the brand to get. After spending time with the company's new AVM 50v, it's clear that there's no reason at all for me to change my tune." To check out the rest of Sound+Vision's great review of the AVM 50v click here!